Speaker of the House Nancy Pelosi (D-Calif.). 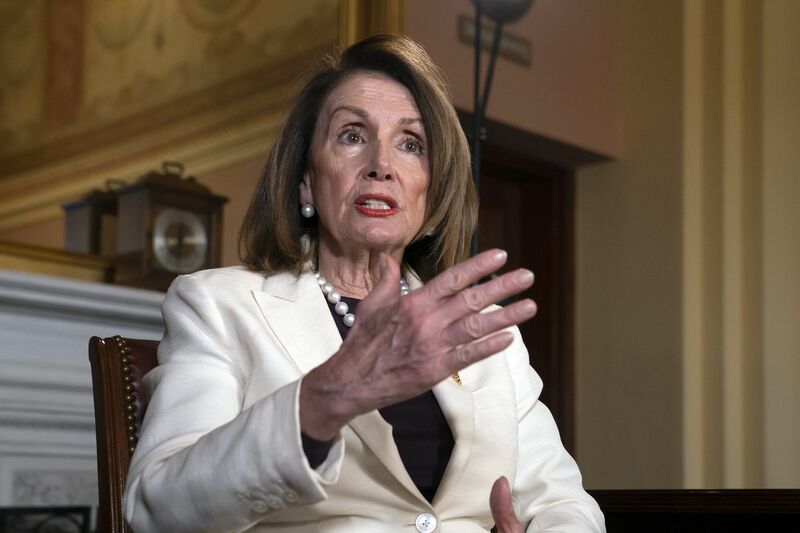 WASHINGTON — President Donald Trump lashed out Sunday night at House Speaker Nancy Pelosi (D-Calif.) on Twitter following a CBS 60 Minutes interview during which she recounted standing up to him and reiterated her opinion that he is unfit for office and knows it. “There’s nobody in the country who knows better that he should not be president of the United States than Donald Trump,” Pelosi told CBS’s Lesley Stahl in a roughly 14-minute segment that aired Sunday. In the wide-ranging interview, Pelosi touted Democrats’ achievements in their first 100 days in control of the House while also discussing last December’s heated Oval Office showdown over funding for Trump’s border wall, her now-famous State of the Union clap and the power she holds in her current position. It is unclear exactly what “crimes” Trump was referring to, but in the past he has suggested Hillary Clinton and Democrats be investigated for colluding with Russia. "Oh yeah, I would do that," Pelosi responded. "Yeah, I probably said that … They just have to know, you throw a punch, you better take a punch." In recent months, Pelosi has made headlines for her public interactions with Trump, often going viral as a result. As The Post's Colby Itkowitz reported in December, she emerged from the White House meeting on border security "not some wilted flower, but a symbol of a woman who doesn't have time for male posturing." Then, at February's State of the Union, she sarcastically clapped at Trump after he called for rejecting "politics of revenge, resistance and retribution" and was crowned "Queen of Condescending Applause."